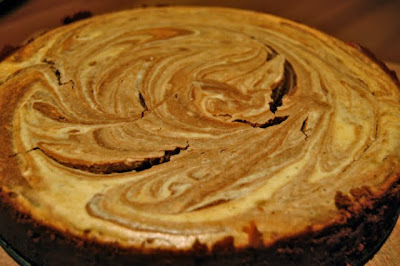 Nutella swirl cheesecake | eat. live. travel. write. 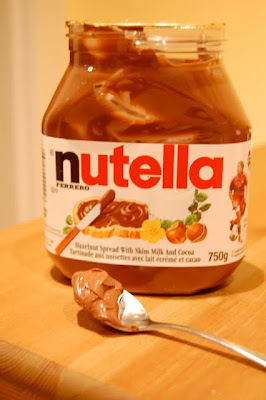 Yes folks, it’s World Nutella Day 2010! Who knew? My contribution? 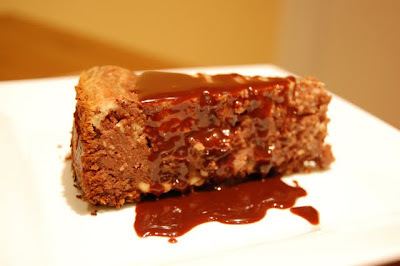 A marbled baked Nutella cheesecake with a molten Nutella sauce. I took my inspiration from this cheesecake I posted around American Thanksgiving, figuring I could substitute Nutella for the pumpkin (ahem, a whole CUP of it!) 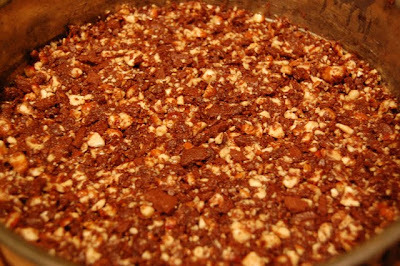 and make the crust with chocolate cookies and hazelnuts instead of gingersnaps and pecans. But augh – it cracked again 🙁 What’s with that anyway? Disclaimer – I have not actually tasted this – recovering from a bout of stomach flu (and yes, I plated this for no-one last night just so I could take a photo, like a big loser!!) but will be doing so this evening, hopefully. In any case, our dinner guests will surely enjoy this one. Oh wow! I am not a cheesecake eater but chocolate + Nutella + more Nutella and I am so there with a spoon and a fork. 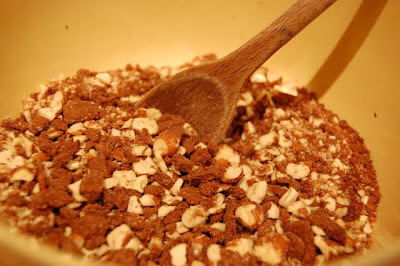 Fantastic Nutella recipe. Fantastic recipe period! Thank you for enlightening me on World Nutella Day! haha Yum! Have you seen those ridiculously massive jars of Nutella you can buy? They're like 3kg or something. I've only ever seen them in Italy, thank God, as they would be surely lethal to keep in the house. Also, according to Wikipedia, the listed oil in Nutella is "vegetable" in every part of the world except US/Mexico/Canada where it is "modified palm". There you go. I hope your tummy is back in action soon! 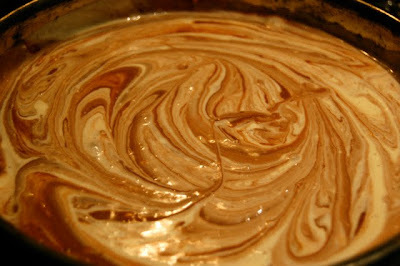 Beautiful cheesecake, the molten nutella sauce sounds amazing! Yes, I just found out about Nutella Day on Wed. I couldn't wait to check out everyones recipes! The cheesescake is just beautiful, what a wonderful way to use it! Happy World Nutella Day Mardi! What a beautiful slice of cake to celebrate with! YUM! 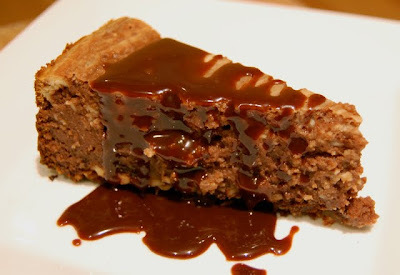 I need a slice or two of this heavenly chocolaty, goodness to help me recover from this hellish week. That crust is inspired, and of course one should always cover up defects like cracks with a delicious sauce! I like the way you think! Hope your stomach feels better! loving this idea mardi! golly i know this is gonna be good! 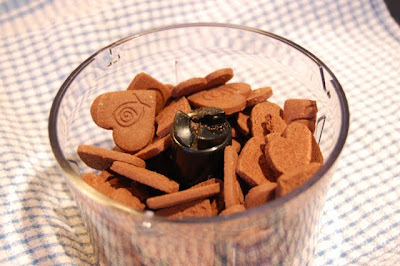 I had no idea about Nutella Day! I bought Nutella for the first time EVER this week. what a coincidence =). That cheesecake looks really good. I love cheesecake! Because we have so many palms growing here in Canada, Conor. Geeesh – how bizarre. Can I say how much I'm looking forward to dessert tonight? Not sure it goes with my stuffed swordfish, but oh well. Hope you are feeling better, Mardi. That looks so delicious and the crust is genius! The boys have Nutella every morning on toast, so I know they would love your cheesecake. Hope you feel better soon! 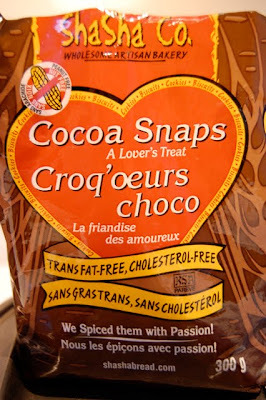 I love the idea of substituting Nutella for pumpkin — nice swap! That swirled cheesecake looks delicious. Get well soon! And a great attempt to do this even though ure ill. I am just licking nutella with a spoon now. Bummer that I missed this. Next time! GORGEOUS…. nthing that molten Nutella can't fix! I love it!! U better feel better soon to enjoy this divine dessert! Jamie – I am honoured you like it even if you are not a fan of the cheesecake! Yvonne – you are going to LOVE it! Kat – you are welcome! Conor – tummy is back in action and survived the dreaded palm oil laced dessert. Because you know that's not gonna put me off my Nutella lady!!! Lyndsey – thanks so much! Trix – glad you agree! Meeta – oh it was! Neil – I think it went really well! Jhonny – It still is mine! Janet – Yeah I was really pleased with the crust. Jessie – it worked out well. 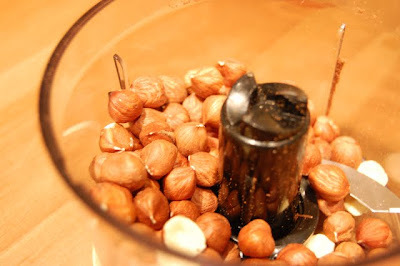 Oh wow, I've been seeing a lot of great Nutella recipes today. Yours looks wonderful! Love it. Looks beautiful… Love the pretty swirl and the molten sauce. Brilliant! Jen – I just need to get the swirl perfected without the top cracking and then we'll be in business! Oh the agony of not being able to taste it! That sauce sounds like one made in heaven, a heaven where nobody puts on weight. It exists, n'est-ce pas? I’m dying here, this is too amazing!! Thanks – it’s been a long time since I posted this and I have finally figured out the baked cheesecake tricks!